Shah Rukh Khan’s wife Gauri has been busy with various interior design projects. The producer turned entrepreneur was photographed outside a skin clinic without make-up in Mumbai on August 6, 2017. 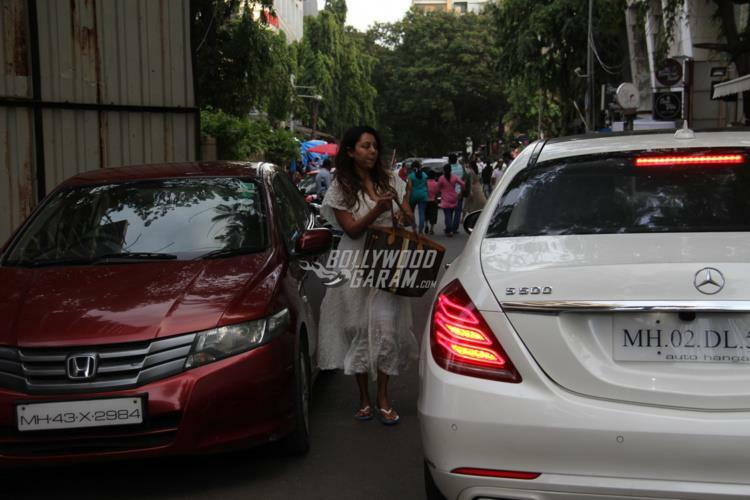 Mrs. Khan looked pleasant even without make-up and was seen wearing an off-white outfit. Gauri is known for designing some of the private spaces of Bollywood celebrities. Karan Johar’s twins were recently treated with a luxury space specially designed by Gauri Khan. Mrs. Khan has also been designing actor Varun Dhawan’s new apartment and is already over with designing Ranbir Kapoor’s bachelor pad. Apart from this, Gauri has also been travelling a lot in connection with her work. The Khan family was recently photographed on a vacation in Los Angeles and were also seen spending time with Boney Kapoor, Sridevi and their daughters. After having a great time holidaying with their children, the Khan family is back to Mumbai and have got busy with work. Shah Rukh, these days, is busy with the promotions of his film Jab Harry Met Sejal that released on August 4, 2017. While many of the star kids like Jhanvi Kapoor (Sridevi and Boney Kapoor’s daughter) and Sara Ali Khan (Saif Ali Khan and Amrita Singh’s daughter) are ready to enter Bollywood, Gauri and Shah Rukh insist on giving their kids proper training for the profession before they get down to it. Shah Rukh in a recent interview said, “I want my kids to make a name for themselves on their own feet. If they want to become a marine biologist, then they should become that. If they want to become an actor or a filmmaker, then that’s also great. I don’t understand this discussion (on nepotism). When I hear the word nepotism, I feel the other person is talking about Napoleon. Even though I know enough English, still I don’t understand it and the discussion. Whether I agree or disagree — I don’t even understand it so how can I have an opinion?” The Kal Ho Na Ho actor’s film, Jab Harry Met Sejal starring Anushka Sharma opened with a descent response and is expected to do good business at the box office.